Irukandji will consider requests to film a movie or television show, or to use the Attraction as a location for commercial shoots. 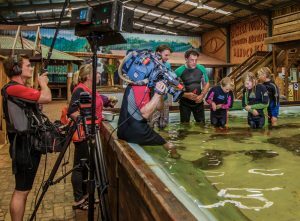 Irukandji supports the industry and requires that all shoots be conducted in an efficient manner with little impact to guests, animals, staff and the physical facility. Please note: The project must be in keeping with the Irukandji’s mission and image for example we would not promote movies similar to Jaws to be filmed here. Irukandji reserves the right to grant or deny permission and to determine the terms under which filming will be permitted. Filming must not detract from our visitors’ experience. Filming should take place outside of our public hours (see Filming Hours below). Permission is granted subject to conditions. A minimum weeks advance notice is requested when possible. While the Aquarium will make every effort to accommodate last minute requests, we cannot accommodate requests with less than 24-hours’ notice. Filming will be generally limited to the public areas of Irukandji. Any requests to film behind the scenes must be agreed upon and are subject to approval of the curatorial and aquarist staff. Requests to film inside exhibits, or up close with animals, must also be arranged in advance with as much notice as possible. Power supplies are limited in areas of the Attraction and any special power needs must be reviewed by the film liaison at least 72 hours in advance of filming. Lighting restrictions may apply to certain areas of the Attraction, at certain times of the day or night, to accommodate animals with photosensitive periods. As well, some animals are disturbed by sudden changes in light levels. Where additional lighting is allowed, the number of lights, the manner in which they are used, and their placement in relation to exhibits must be approved by animal care and curatorial staff (some windows are acrylic and can be damaged by hot lights). The safety and welfare of all of our animals remains Irukandji’s first priority. If, at any time during filming, the Attraction determines that animal welfare is being endangered, the production company will be required to cease filming, or alter filming procedures. If at any time the production company’s activities threaten to disrupt the Attraction’s operations or the experiences of its visitors, the Aquarium reserves the right to require the company to reschedule those activities. Aquarium exhibits and graphics may only be altered with the permission and must be returned to their original state following filming. Set construction is permitted, provided nothing is permanently attached to walls or other structures. No tape or nails may be applied to walls or exhibits. All materials brought into the Attraction must be removed after filming by members of the production crew. Staff and service costs, are in addition to the rental rates and are based on the requirements of the shoot as determined, in consultation with you. Maintenance, major construction, repairs, and custodial work occurs outside public hours. While sound is being recorded, we will make every effort to minimize noise, but please be aware we cannot guarantee a quiet environment. Maintenance crews (pressure washers, vacuums, polishers, etc.) must have enough time to complete their work before the Aquarium opens to the public each morning. Unless otherwise agreed, all film and photographs shot by the production company belong solely to it. The Attraction requests a final copy of the production for archival purposes only. The production company may use film and photographs shot at the Attraction solely for the purpose stated in the Film Contract. The company may not sell individual shots or images to third parties, separate from the project, without written consent from Irukandji. The production company is fully responsible for all damages occurring at the attraction during its use and for paying for all repairs.